In summer 1896, young Hugo Simberg embarked on his first journey abroad via London to Paris. He was particularly taken with the liveliness of Paris, whose elegant and artistic denizens took his fancy. He painted by day in a local private academy, spending afternoons in museums and galleries and meeting other artists. Yet hardly any of this was carried over into his work. He was preoccupied by something entirely different. It was during the trip to Paris that he conceived of The Garden of Death. The Garden of Death shows skeletal figures dressed in black robes, gently tending strange, scraggy flowers. Simberg has given us an explanation of the background to the work. According to him, the garden of death is where souls go before being admitted to heaven. The plants symbolise human souls that are awaiting their future fate in this humble form. The figure of death in the foreground welcomes the viewer into the labyrinthine garden. This is a necessary stopping place – it is the only way to go through. In the background, a road leads further away into the distance. The prosaic quality of the scene is emphasised by a watering can and a towel hanging from a hook. 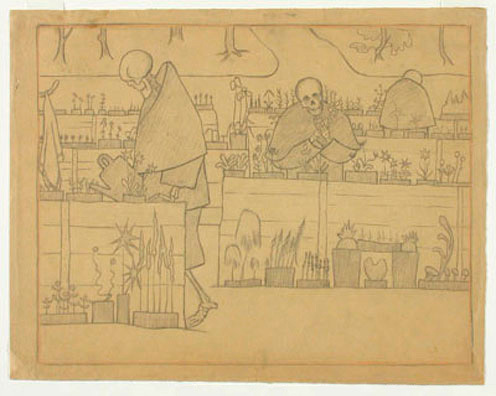 The Garden of Death, sketch for the fresco in Tampere Cathedral. Undated. Sketch for the fresco in Tampere Cathedral. 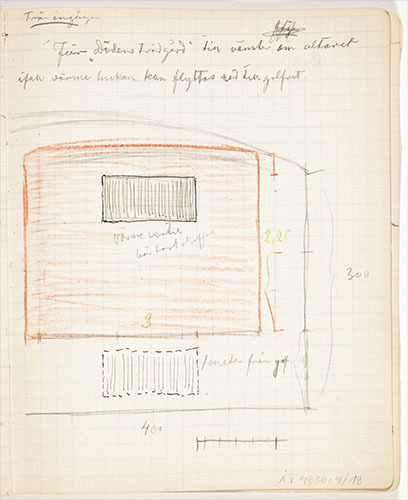 Extract from Hugo Simberg’s sketchbook. 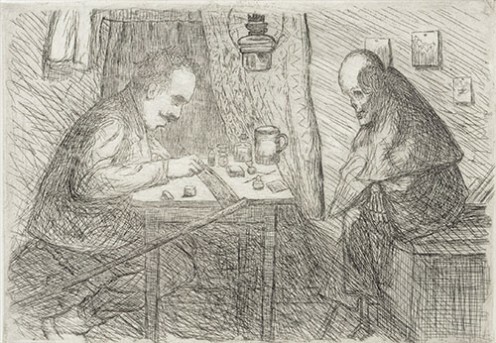 Simberg’s skeletal figure was already complete by its debut appearance. Dressed in a short black cape and breeches, its appearance remained unchanged when Simberg made, as was his custom, the same picture using several different techniques. In addition to the picture painted with watercolour and gouache, he also made prints of it, drawings, a tempera and, finally, a fresco version in Tampere Cathedral. 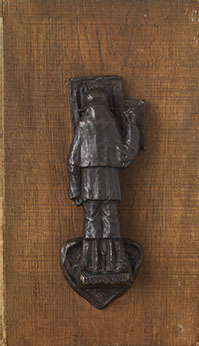 He even created a bronze knocker featuring the figure. The knocker’s loud sound disturbed the occupants so much that it had to be removed. 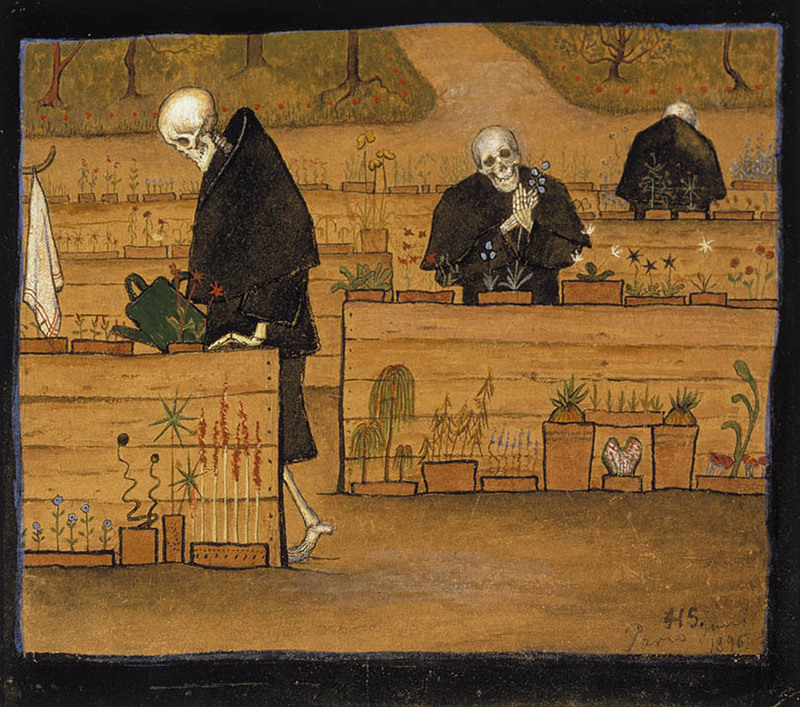 Simberg’s kind, plant-tending death is not frightening. It has only been assigned a task that unavoidably causes pain.